LaVonne was born in Estherville, Iowa to Martin and Valeta (Dundas) Griese. She was the eldest of two sisters, Mary and Harriet, and was mostly known by her nickname Bonnie. She grew up in Burt, Iowa and when Bonnie was 10 years old she was diagnosed with one of the five cases of polio in Burt. You’d never know it as she never let it restrict her dreams and desires. LaVonne attended and graduated from Burt High School. After graduation she worked for the Union Pacific Railroad in North Platte, Nebraska. Her great fortitude was displayed during the war effort, riding her bike the 6 miles to work. 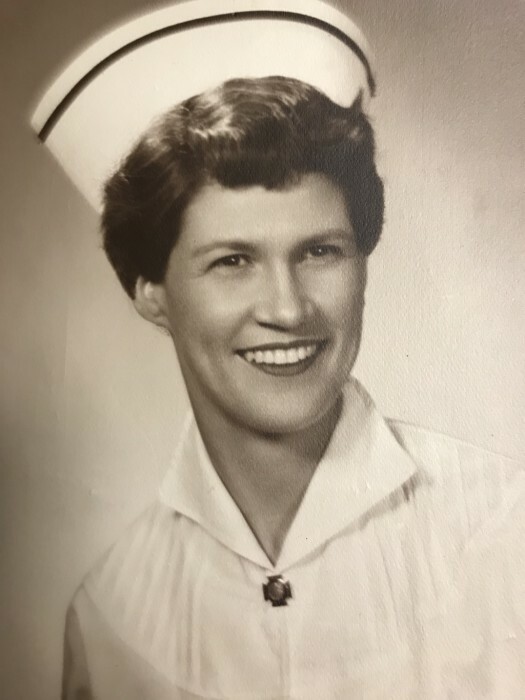 When WWII ended she worked as a Nurses Aid in Kossuth County Hospital, saving her money to attend the Presentation School of Nursing in Sioux Falls, South Dakota, graduating as an RN in 1956. In 1957 she married Merle Schaff, and they started their family of five children. In 1965 the family relocated to New York, where she forged lifetime friendships to this day. Another relocation after ten years took the family to Missouri Valley, Iowa. A final move to Toledo, Oregon in 1978 where her career continued at the Newport Hospital, retiring after thirteen years in 1993. Throughout her life Bonnie was surrounded by kids. First her own, then 9 grandchildren, followed by 11 great-grandchildren. Memories of going to her house nearly every day to enjoy an after-school snack of homemade bread and cookies. They fondly remember gathering eggs from the chickens for Grandma, picking blueberries and wandering free, full of childhood imagination. Her door was always open! She is survived by her husband Merle “Bud” of Toledo, and her children; Steve Schaff and Sue Ann Seils, both of Salem, Sheila Huguley of Sweet Home, Jay Schaff and Mary Flatt, both of Toledo. She is also survived by her sisters Harriet Shivers of Newport and Mary Maack of Houston, Texas. Bonnie was a brave and adventurous lady, raising five kids, she had a wonderful Nursing career, and rose to every challenge of life. She enjoyed quilting and antiques. Bonnie was a member of St. John’s Episcopal Church in Toledo. She loved to bake and always had the best cookies in the cookie jar. She was the heartbeat of our family and is best remembered by her smile & unconditional love for all she encountered. She holds a special place in so many hearts, her family, her long-time friendships and her Church community. There will be a Celebration of Life at the Union Hall in Toledo 2:00-4:00 Sunday March 24.